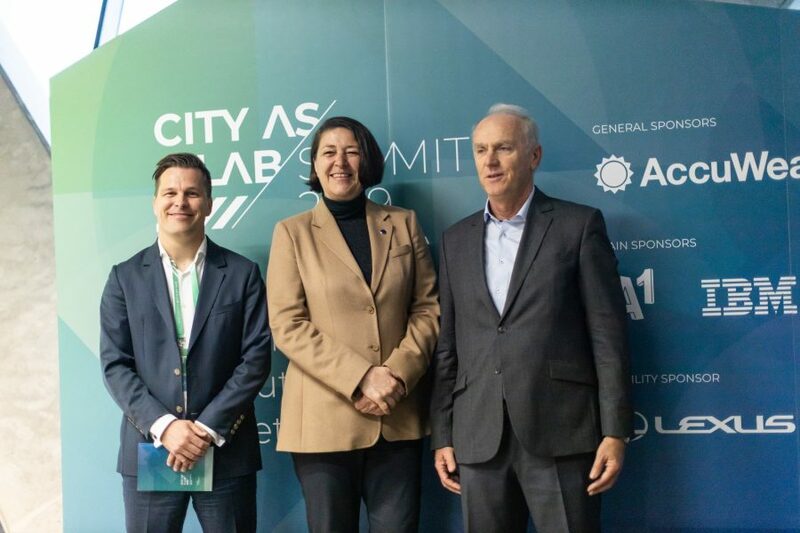 First international City as a Lab Summit attracted more than 200 guests from 19 countries • BTC d.d. 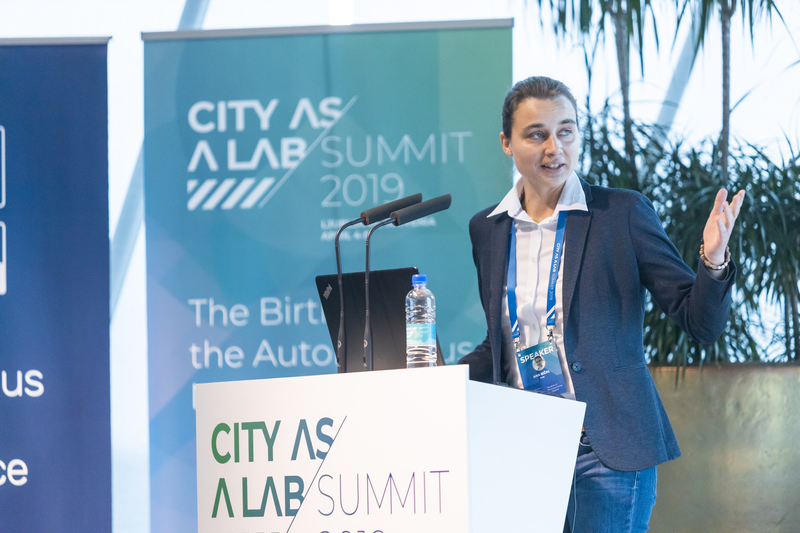 On 4th and 5th April 2019, BTC City Ljubljana hosted the first international and inter-industry event City as a Lab Summit 2019: The Birth of Autonomous Marketplace, which was attended by over 200 guests from 19 countries. 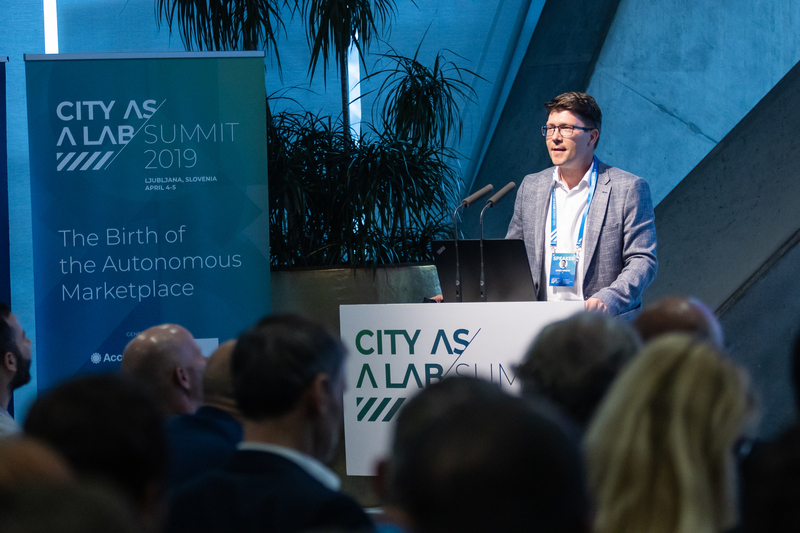 The common thread of the event were new opportunities brought to different industries by autonomous vehicles and new forms of mobility. 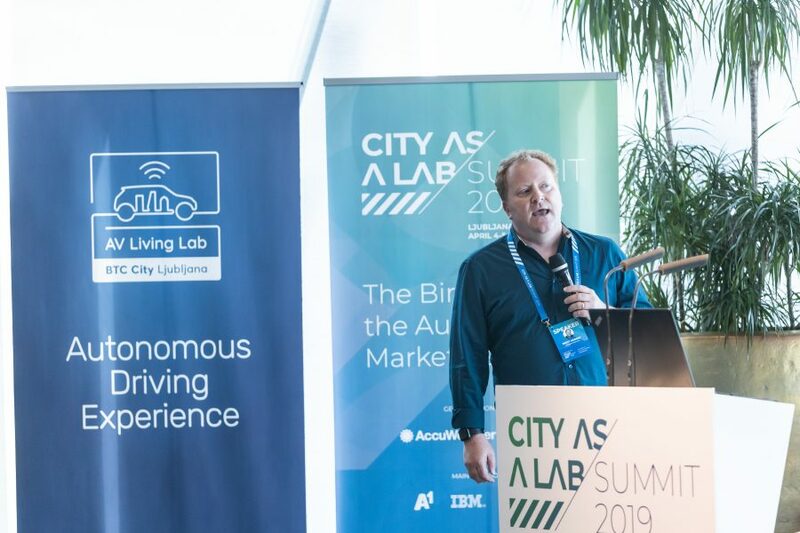 The event was organised by AV Living Lab, which by connecting digital and physical infrastructure in BTC City Ljubljana offers companies from different industries an ideal testing environment for testing the mobility solutions of the future. The event’s general sponsors were the BTC Company and AccuWeather from the USA – one of the largest providers of weather information. 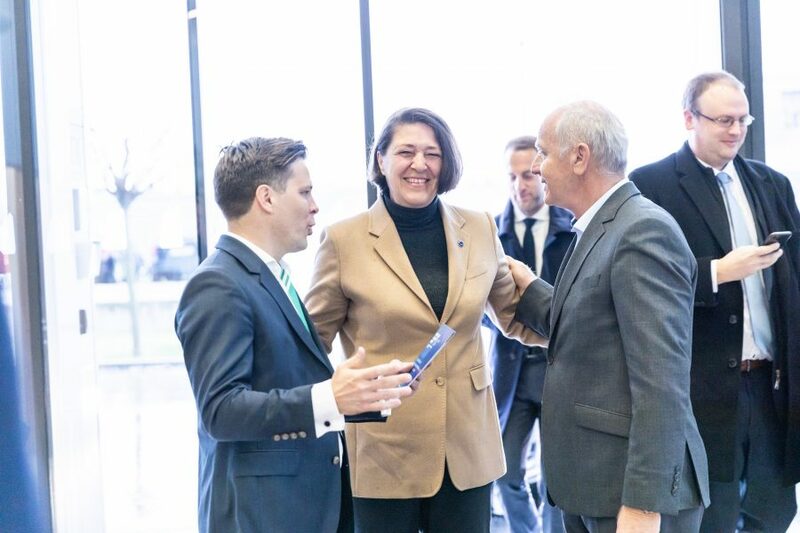 The summit was also supported by A1 Slovenija, Nomago, IBM, and Lexus as the official mobility partner. 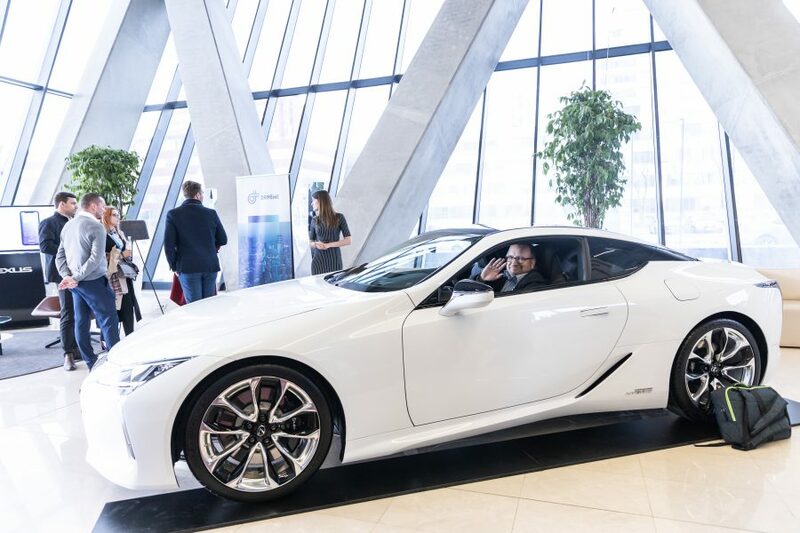 The speakers at the event emphasised the significance of autonomous vehicles which will in the future affect our lives and different business environment on a large scale and will introduce a similar disruption to the market as smartphones in 2008. 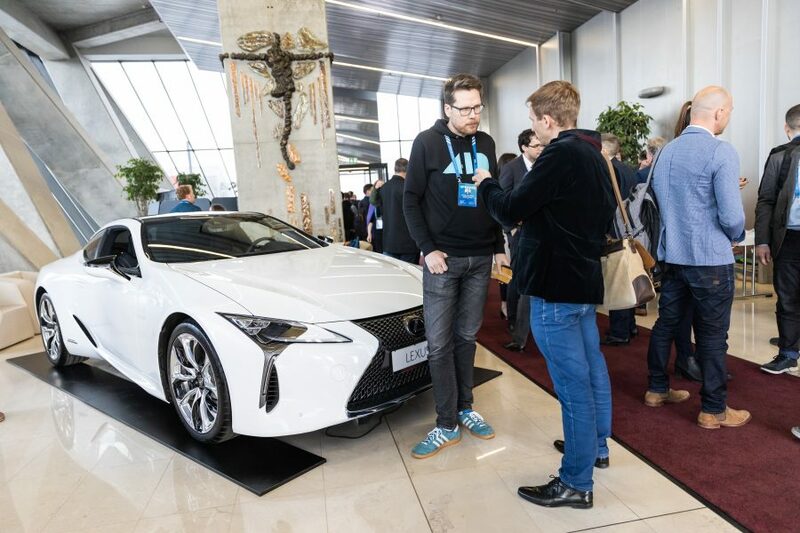 The speakers also mentioned the significance of a living testing environment, such as BTC City Ljubljana, where car manufacturers and representatives of other industries may test and upgrade their solutions in the developmental phase of autonomous driving. 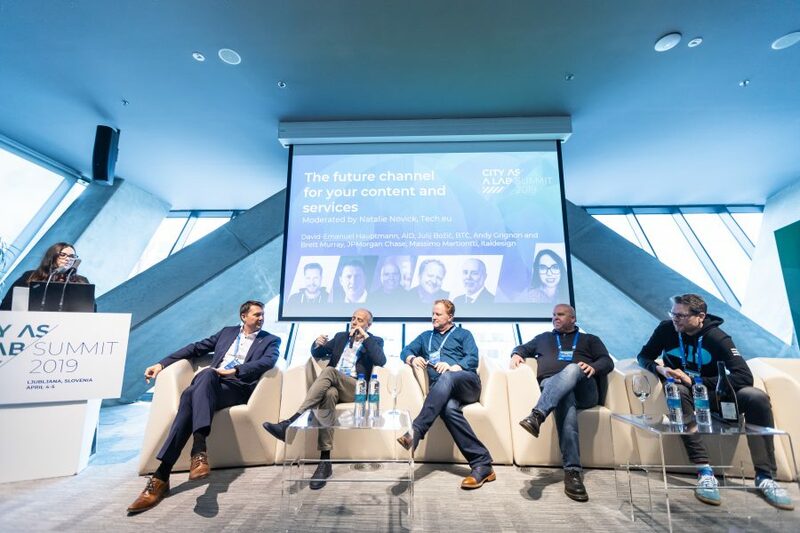 The era of autonomous vehicles does not introduce only new technological solutions for vehicles, but also a brand new environment for selling services and contents that can be tested and developed only within a living testing environment. 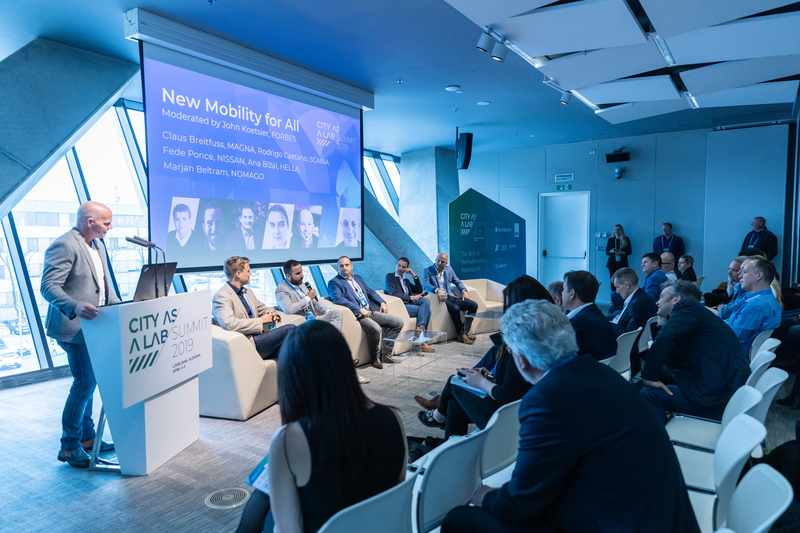 Furthermore, the speakers also spoke about the numerous advantages of autonomous vehicles for our lives, as they will significantly improve the safety, comfort, and experience of mobility. Additionally, they will shorten the travel time and consequently give us more time to spend on work, relaxation, fun, or shopping via new platforms since there will be less vehicles on the roads. On the first day of the event, the ideas, experiences, and challenges were presented by Claus Breitfuss from Magna, Rodrigo Caetano and Ruther Hörndahl from Scania, Ana Bižal from Hella, Fede Ponce from Nissan, Daniel-Emanuel Hauptmann from AID (Autonomous Intelligent Driving), owned by Audi, Brett Murray and Andy Grignon from the largest US bank JPMorgan Chase, and Marjan Beltram from Nomago. 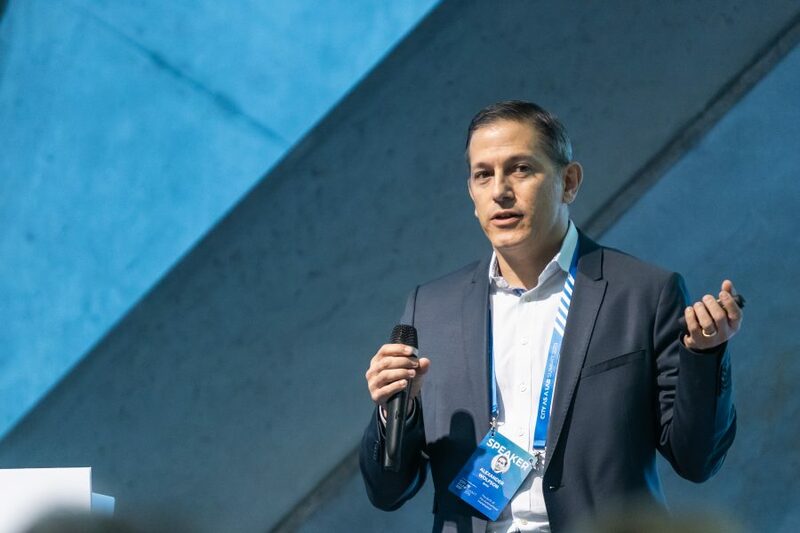 “Autonomous vehicles will shorten the time needed to drive to work, which will affect the prices of properties outside big cities, reduce loans for purchasing cars, and at the same time open a brand new consumer environment,” pointed out Brett Murray, Executive Director & Head of Strategic Design Innovation at JPMorgan Chase, who in this new era also sees new opportunities for banks. “New mobility means that we will ensure that customers reach point B from point A. How they will manage this path is completely irrelevant. 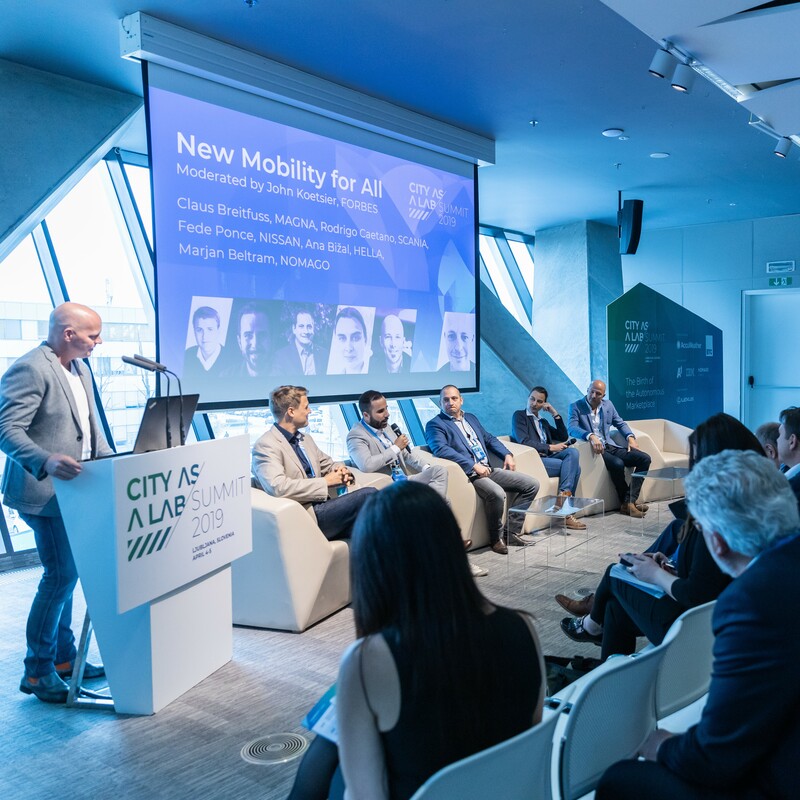 In cities, we will probably deal with a combination of transportation vehicles, e.g., cars, scooters, and bicycles,” said Marjan Beltram, Executive Director of Tourism and Mobility Services at Nomago. “Safety will be the key component of autonomous vehicles since it will be determined by regulations. These will need to be a bit loosened by legislators, which will mean less safe vehicles. 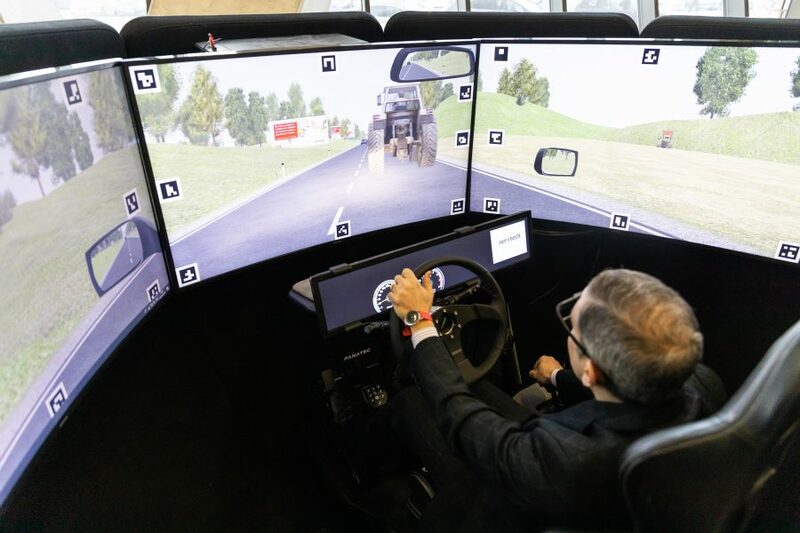 Is that even acceptable?” asked himself Claus Breitfuss, Senior Manager for Mobility Solutions at Magna. “The key element of autonomous vehicles will be the experience, which will be tailored by manufacturers of lights. For example, with LED-lights we can create a special ambience in the car – calm, evening-like, office-like, etc., suitable to the activity and atmosphere made by the passengers in the car. 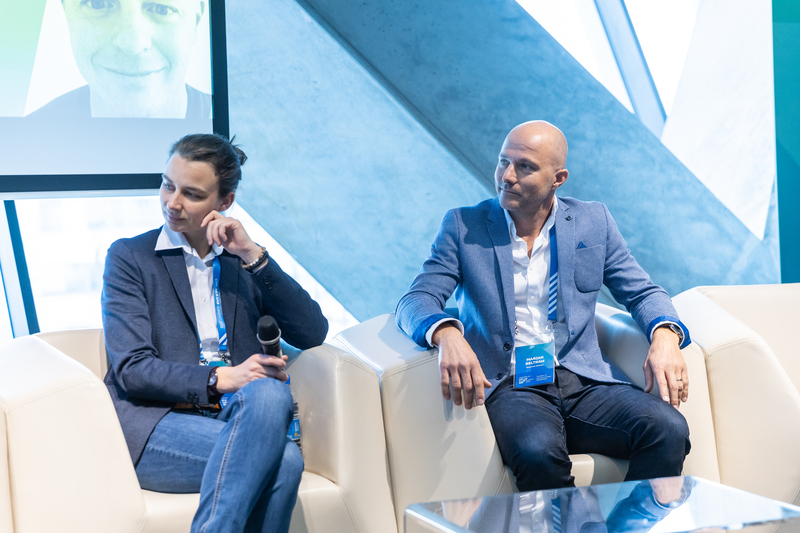 With lights, we can also communicate warnings in case of danger,” Ana Bižal, Head of Lighting Innovation Pre-development and Development Lighting Technology at German company Hella, pointed out the role of suppliers. “In the future, we will be selling vehicle capacity – the number of seats, and no longer vehicles. 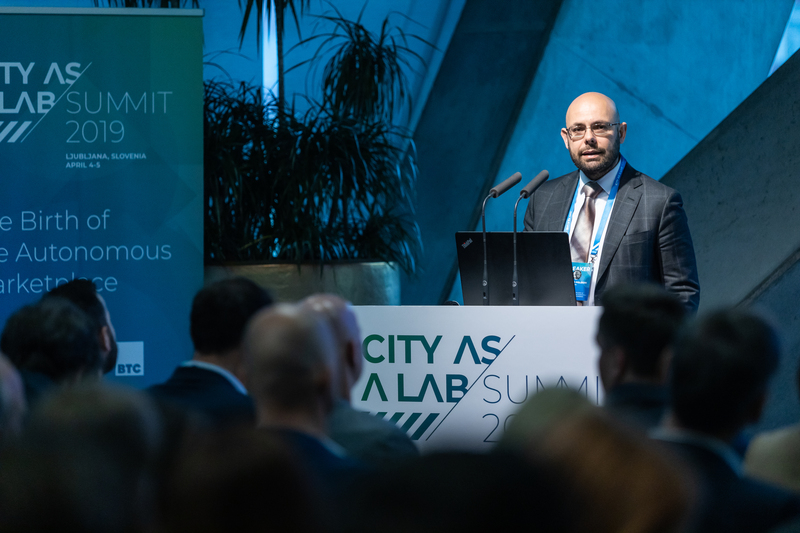 City transportation will be 100% electric and autonomous,” believes Rodrigo Caetano, Global business Development – Business Area Autonomous Solutions at Scania. “Autonomous cars must be designed according to the wishes of people. They need to be useful, desirable, and environmentally acceptable from the perspective of manufacturing and not only the type of power. They need to provide passengers with an excellent experience, adapted to the needs and wishes of individuals. 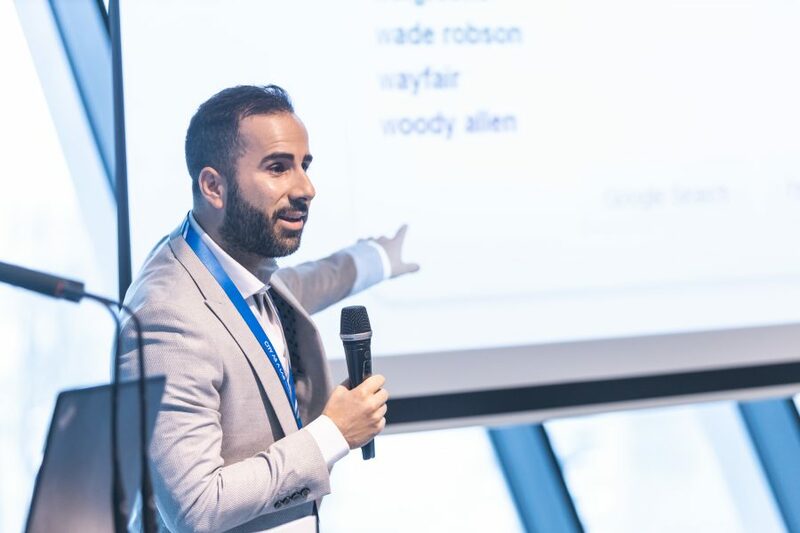 For example, for pensioners they could paint beautiful memories,” is the vision of Fede Ponce, Senior Consultant for Advanced Projects and Future Vision at Nissan. “A completely automated, autonomous drive is the toughest engineering challenge since man stepped on the Moon. 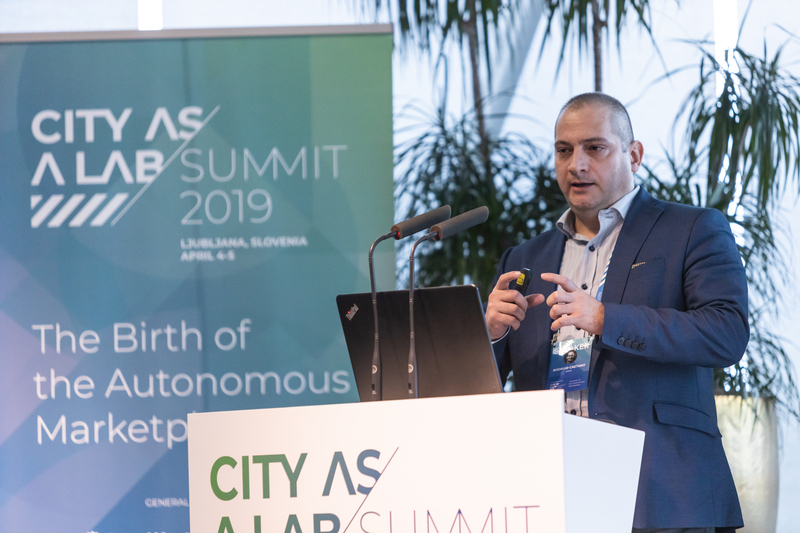 The leap from partial to completely automated driving will be made by technological companies and not car manufacturers,” said Daniel-Emanuel Hauptmann, Business Product Manager at AID (Autonomous intelligent Driving). “Autonomy has moved up to the air; first, we will discuss reaching the altitude of 500 metres. 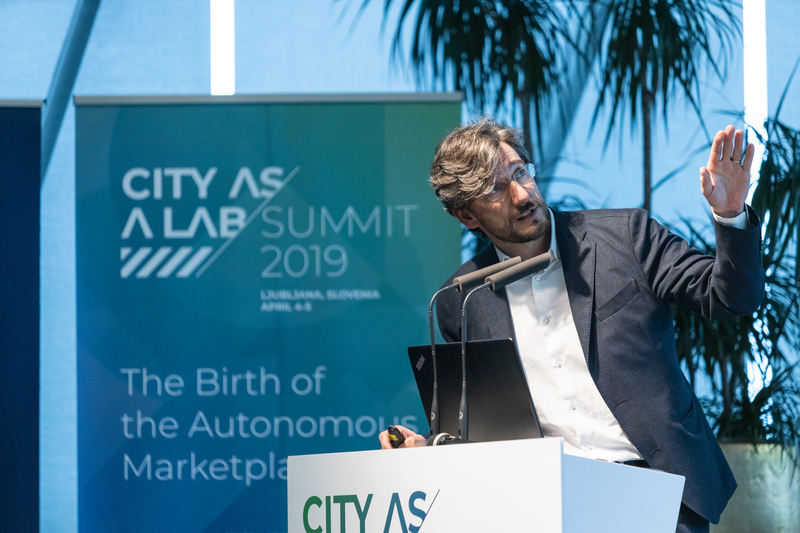 The key element of autonomous transportation vehicles is to give people more time and not to improve productivity,” explained the designer of Robot Pop-up Taxi Massimo Martinotti, Head of Mobility Solutions at Italdesign. 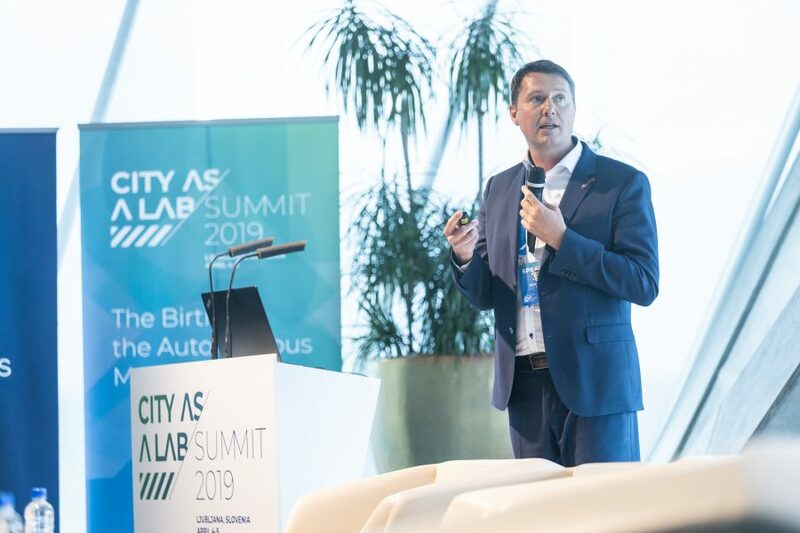 The advantage of a city playing a role of a laboratory, as in the case of BTC City Ljubljana, lies in the fact that car manufacturers and companies from connected branches can test their product in different developmental phases. 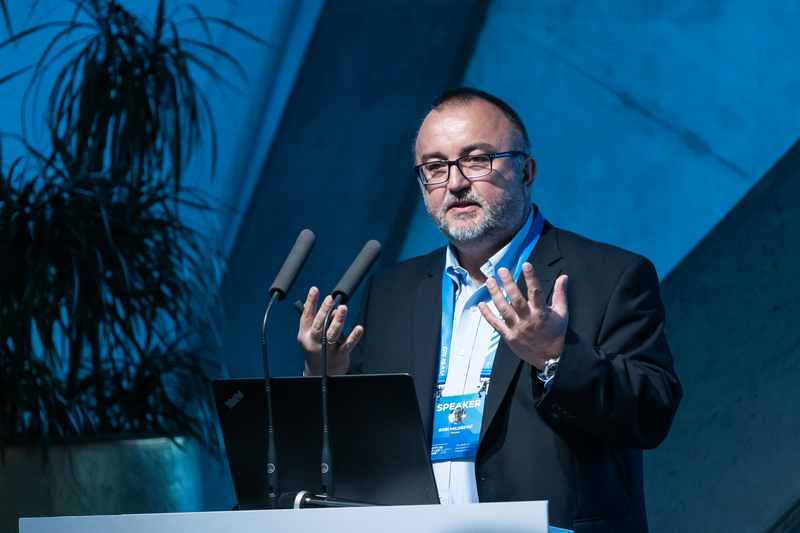 They gain realistic results in a real-life environment, something they cannot do on closed polygons,” said Radovan Sernec, Chief Innovation and Technology Officer (CITO) at AV Living Lab. “Autonomous vehicles will improve the quality of our lives as they will provide us with more free time. They will also have a significant impact on the environment. 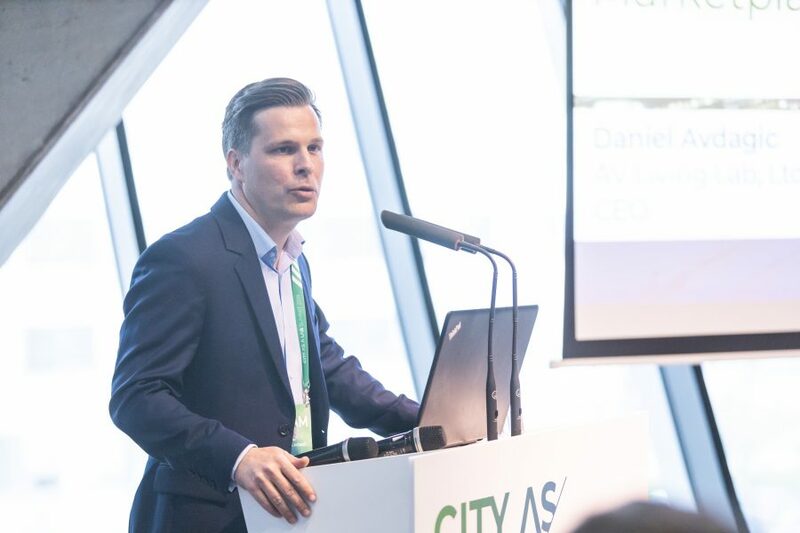 In the future, BTC City Ljubljana will reduce the number of parking spaces, which will be replaced by green surfaces; thereby, we will bring BTC City Ljubljana even closer to our visitors,” said Julij Božič, Executive Director for Innovation and Digitalisation at BTC, d. d.
“We provide car manufacturers, suppliers, and other industries with a testing centre where they can all in one place, and not dispersed like before, test out different technologies in autonomous vehicles, from sensors to the infotainment system, which users will use far more often when driving is taken over by the car,” explained Daniel Avdagič, Managing Director at AV Living Lab. 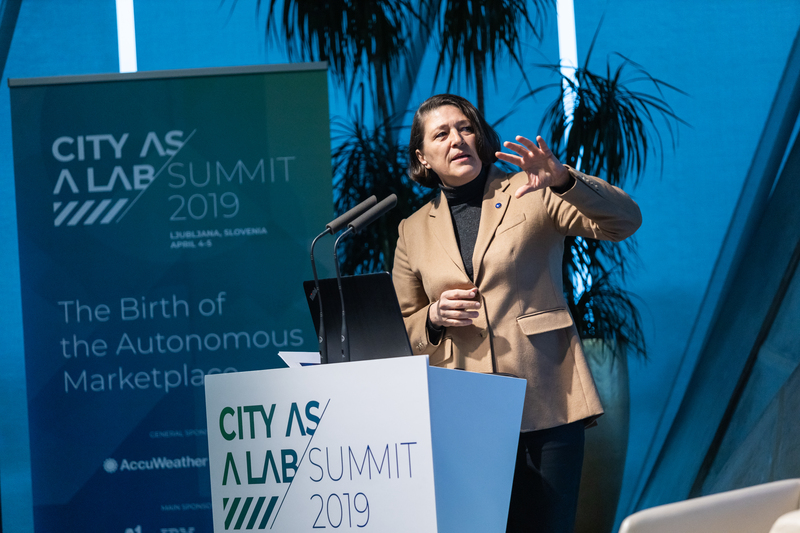 European Commissioner for Mobility and Transport, Violeta Bulc, introduced the second day of the event City as a Lab Summit. 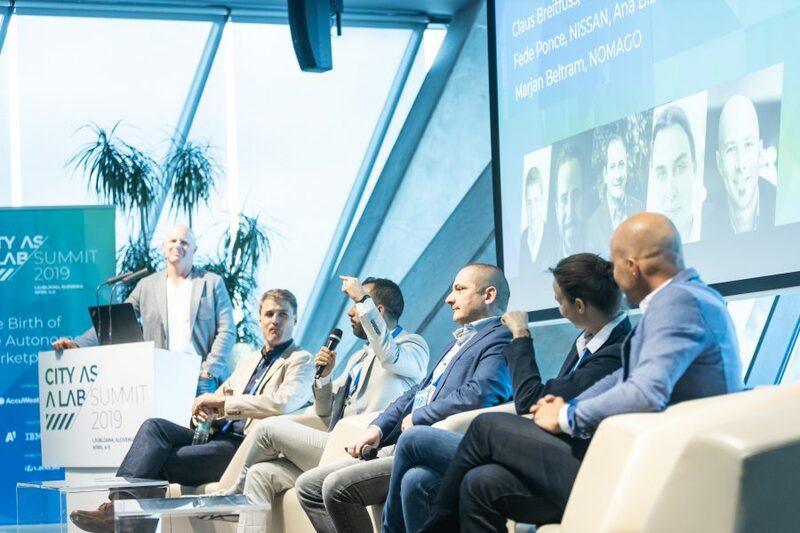 Speakers who followed were Stefano Polidori, International Telecommunication Union, David Mitchell, AccuWeather, Janez Križan, A1 Slovenija, Abhishek Shukla, HPE Ventures, Luigi Ksawery Luca’ from Toyota, Bobi Milošević from Daimler and Alexander Wolfson from BMW. “It’s about people, not machines, cars, and drones. This is the main guideline for future industry and stakeholders. 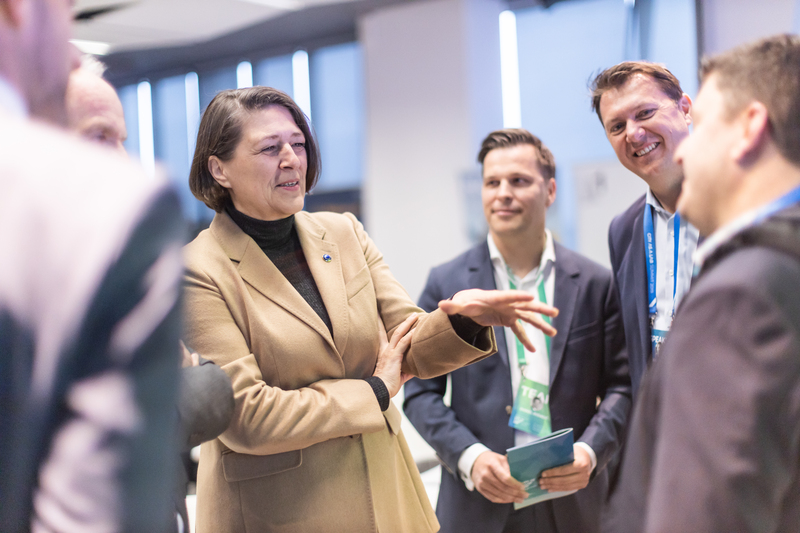 In Europe, we will fight hard against monopolies, also against monopolies of telecommunication companies,” said Violeta Bulc, European Commissioner for Mobility and Transport. 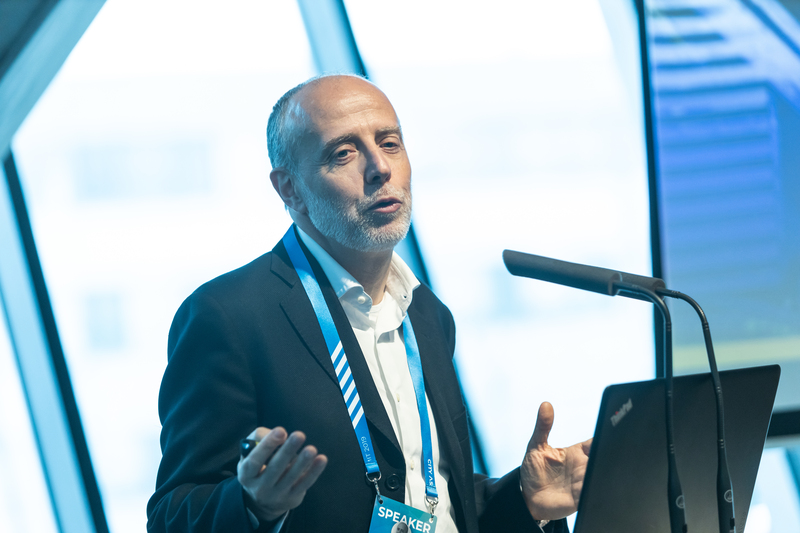 “Undoubtedly, the era of autonomous vehicles will bring new business opportunities and new scenarios, offering a chance for the rapid development of industry,” believes Stefano Polidori from a study group of advisors at International Telecommunication Union. “How will a precise weather forecast with regard to autonomous vehicles make your life easier? It will tell you when to get up and when to leave the house in order not to be late for a meeting. It will explain the conditions you are about to encounter on the road, which route to take, and whether or not you should even take it. 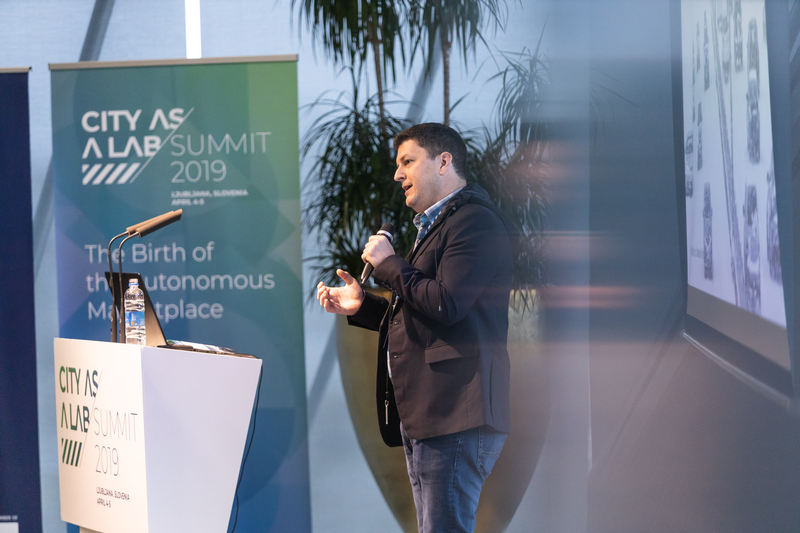 An autonomous vehicle will have to make the right decisions in order for you to trust it,” said David Mitchell, Vice-President of Emerging Platforms Department at AccuWeather. “I believe that smart cities and the technology of autonomous vehicles will bring new business opportunities and new ways of paying for services,” emphasised Janez Križan, New Business Development and Innovation Director at A1 Slovenija. “The infotainment system in cars is part of edge computing. We are talking about data, managed by computers. They are the ones making decisions. In 2023, 73% of data will be provided by edge computing. 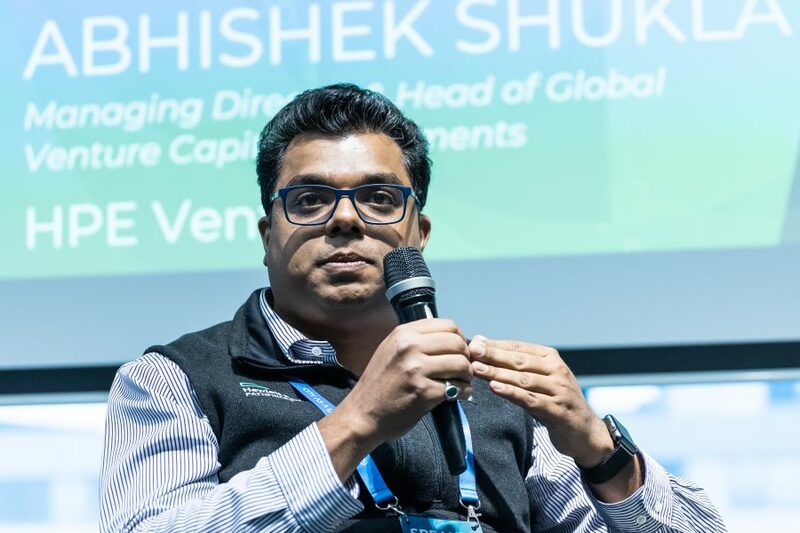 Decisions will be made in a matter of milliseconds – for speed like that, we will need a 5G network,” stated Abhishek Shukla, Managing Director and Head of Global Venture Capital Investments at HPE Ventures. “We are transforming from a car company into a company with business in the field of mobility. 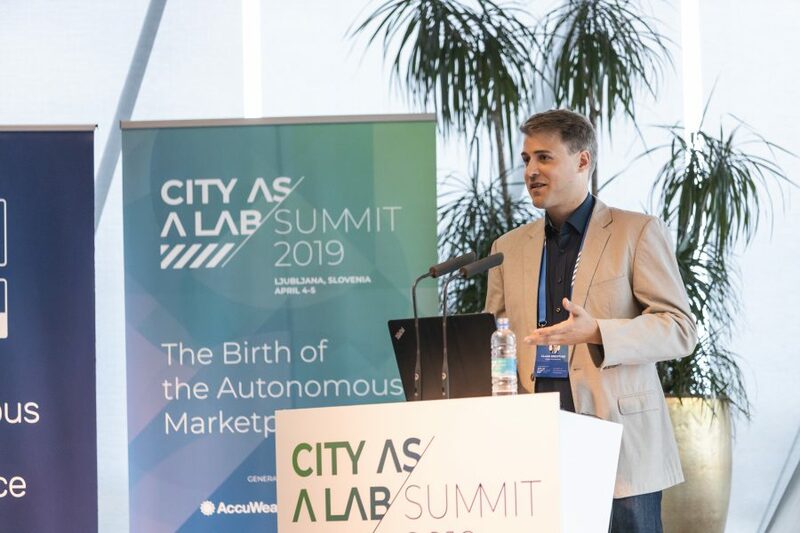 Our business is based on believing in cities that are becoming our buyers and partners,” said Luigi Ksawery Luca’, Director of Mobility and Connected Car at Toyota. 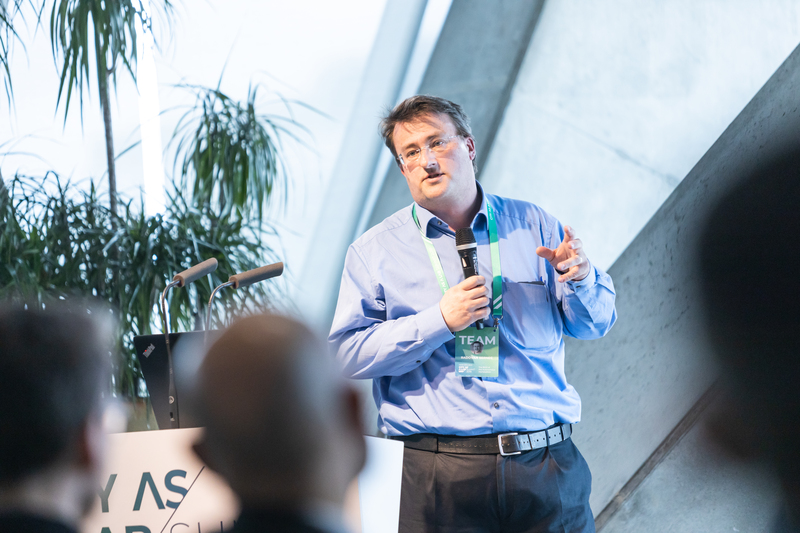 “In Daimler, we do not believe in a closed system of data accessing. 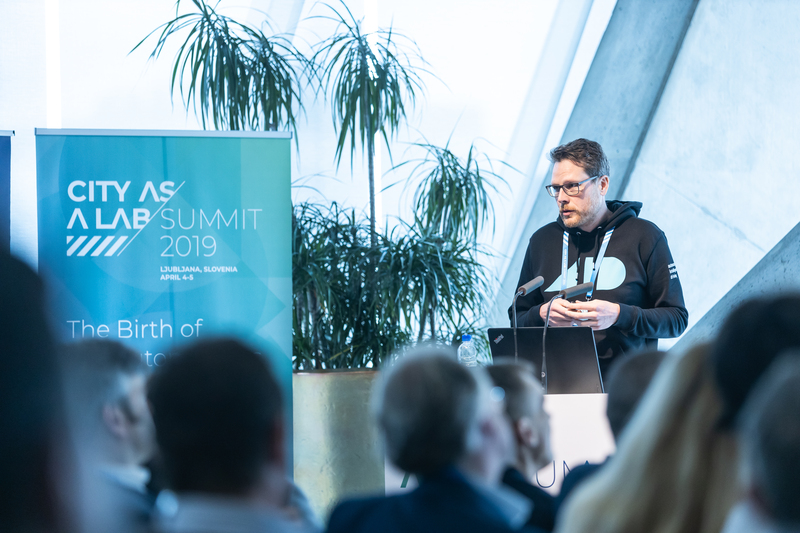 Data is crucial for the development of the industry, yet technology must be under control,” explained Bobi Milošević, Digital IT Marketing and Sales at Mercedes-Benz Cars at Daimler. “BMW has always produced excellent cars, desired by buyers. Today, our challenge is to create excellent buyers, users of services. We can only achieve this by offering excellent services and an excellent experience,” said Alexander Wolfson, Head of Consumer Management, Digital Services at BMW. 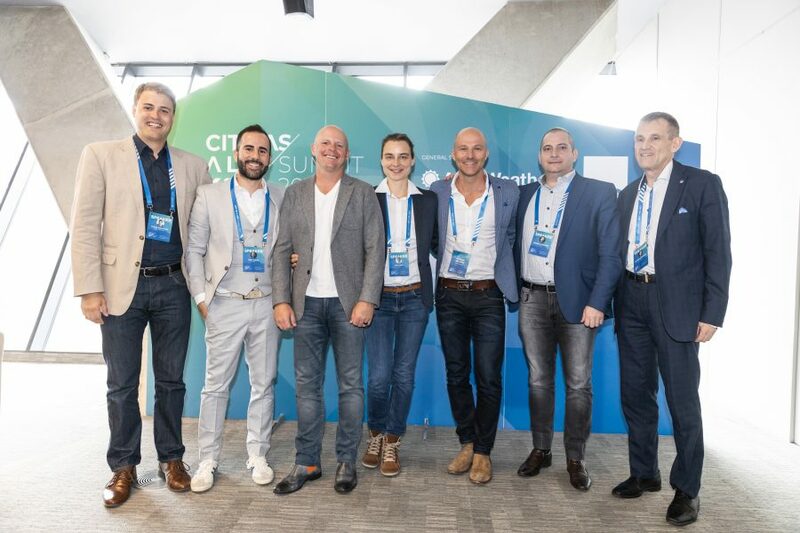 It is no coincidence that the event took place in Crystal Palace in BTC City Ljubljana with the support of the BTC Company. In the last 65 years, the BTC Company has transformed from public warehouses into an area where today modern technologies and new business models meet. 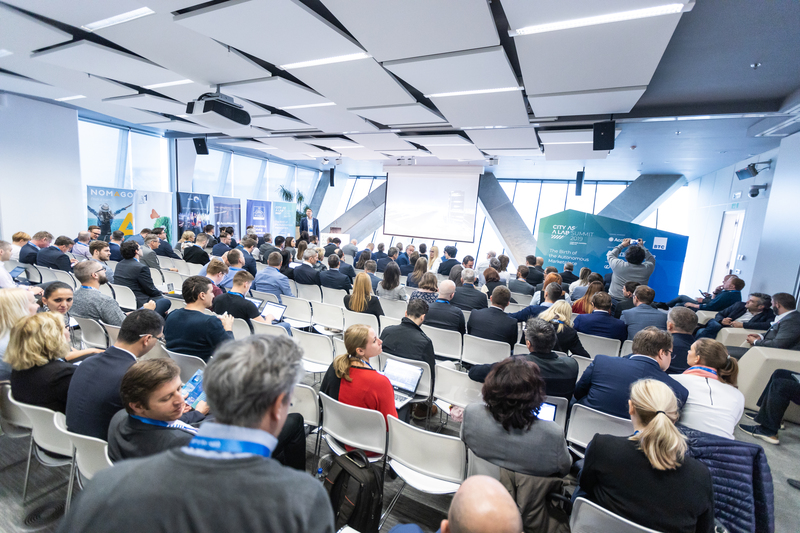 Establishing innovative centres the ABC Accelerator and the ABC Hub, the Innovation and Digitalisation Business Unit and the concept of a living testing environment which turned BTC City Ljubljana into a testing ground for the most modern of technologies, bringing advanced solutions to consumers’ every day, as well as introducing the possibility of paying for products and services in cryptocurrencies, has transformed the BTC Company over the past five years into a modern, open, and innovative company that is becoming the synonym of changes by rapidly and successfully adapting to trends and conditions on the market. A year ago, the BTC Company recognised the potential of transforming the mobility and its impact that can be compared to the introduction of smartphones. Therefore, they established the company AV Living Lab, which connected the digital and the physical infrastructure of BTC City Ljubljana and offered it as an ideal testing environment for the mobility of future. According to predictions, the mobility industry will have reached USD 7,000 billion and will affect all industries.